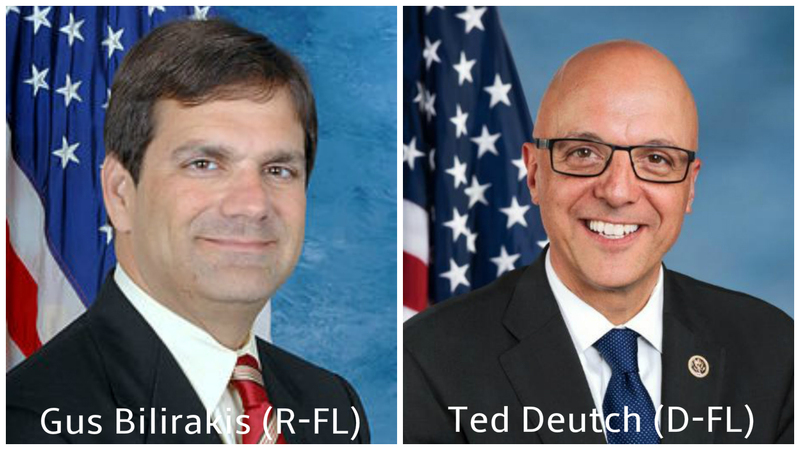 Florida Representatives Gus Bilirakis (R-FL) and Ted Deutch (D-FL) have signed a letter that will be sent to U.S. Ambassador James Warlick later this week calling for increased security measures and confidence building mechanisms along the Nagorno Karabakh-Azerbaijan border. Congressman Bilirakis serves as Co-Chair of the Hellenic Caucus, Co-Chair of the Hellenic Israel Alliance Caucus, and Vice-Chair of the Armenian Caucus. “When violence and aggression become a pattern in a historically turbulent region, we, as American policy leaders, should speak out strongly to dispel further hostilities,” Congressman Bilirakis told FLArmenians.com. “That is why I joined my colleagues in a letter to James Warlick, U.S. Co-Chair of the Organization for Security and Cooperation in Europe (OSCE) Minsk Group urging a just and peaceful resolution to the conflict. Azerbaijani aggression must stop so that peace and security can return to the region as swiftly as possible,” he said. Congressman Deutch, whose Palm Beach County district is home to the largest Armenian community in Florida, serves with Bilirakis as the Co-Chair of the Hellenic Israel Alliance Caucus. “I want to thank our Florida Representatives, Gus Bilirakis and Ted Deutch, for their support in calling for an end to the escalating violence against Armenia and Karabakh,” stated District 21 resident and Florida Armenians Boca Raton Chair George Sarkisian. As FLArmenians.com previously reported, House Foreign Affairs Committee Chairman Ed Royce (R-CA) and Ranking Member Eliot Engel (D-NY) are circulating a bipartisan letter asking their Congressional colleagues to support renewed U.S. leadership in the South Caucasus. The deployment of additional OSCE observers along the line of contact to better monitor cease-fire violations. According to sources familiar with the negotiations, the governments of Armenia and Nagorno Karabakh have both pledged their support for these confidence-building measures, while Azerbaijan has repeatedly opposed them. Over fifty-five members of Congress have signed the Royce-Engel letter to Ambassador Warlick. In addition to the House Foreign Affairs Committee leadership, the letter has the support of House Permanent Select Committee on Intelligence Chairman Rep. Devin Nunes (R-CA) and Ranking Member Adam Schiff (D-CA), U.S. Helsinki Commission Chairman Chris Smith (R-NJ), Appropriations Committee Ranking Member Nita Lowey (D-NY), and former Democratic Congressional Campaign Committee chairman Steve Israel (D-NY). Congressman Schiff wrote a separate letter to Ambassador Warlick earlier this month warning, “unwillingness to speak plainly about the aggressor in this conflict sends the message to Azerbaijan that it can act with impunity.” “I do not believe the cause of peace is served by ignoring Azerbaijan’s increasing belligerence and the suggestion that both parties are equally to blame for violence along the Line of Contact when that is not the case,” Schiff’s letter states. We are writing out of concern over the escalation of violence in Nagorno-Karabakh, resulting in deaths on both sides of the conflict. It is our hope that the United States, through its role in the Organization for Security and Cooperation in Europe’s (OSCE) Minsk Group, as well as through direct diplomacy with both Armenia and Azerbaijan, will immediately advocate for several steps to promote peace in the region. We believe that securing the full and public support of Azerbaijan, Armenia, and Nagorno-Karabakh for the following steps would, in the short-term, save lives and help to avert war. Over the longer term, these steps could contribute to a comprehensive and enduring peace for all the citizens of the region. An agreement from all sides not to deploy snipers along the line of contact. The placement of OSCE-monitored, advanced gunfire-locator systems and sound-ranging equipment to determine the source of attacks along the line of contact. We also urge you to publicly condemn specific acts of aggression along the line of contact. The longstanding U.S. and OSCE practice of responding to each new attack with generic calls upon all parties to refrain from violence has failed to de-escalate the situation. Instead, this policy of artificial evenhandedness has dangerously increased tensions. There will be no peace absent responsibility. Thank you for your consideration of these recommendations. We continue to support your efforts to reach a durable and just resolution to this conflict and look forward to your response. House Foreign Affairs Committee Chairman Ed Royce (R-CA) and Ranking Member Eliot Engel (D-NY) are circulating a bipartisan letter asking their Congressional colleagues to support renewed U.S. leadership in the South Caucasus. Click on the image to send an email to your Representative urging them to sign the Royce-Engel letter. Thirty-five members of Congress have signed the Royce-Engel letter to Ambassador Warlick, including Armenian Caucus Vice-Chair Rep. Gus Bilirakis (R-FL). In addition to the House Foreign Affairs Committee leadership, House Permanent Select Committee on Intelligence Chairman Rep. Devin Nunes (R-CA) and Ranking Member Adam Schiff (D-CA) are also supportive. In fact, Congressman Schiff wrote a separate letter to Ambassador Warlick last week warning that “unwillingness to speak plainly about the aggressor in this conflict sends the message to Azerbaijan that it can act with impunity.” “I do not believe the cause of peace is served by ignoring Azerbaijan’s increasing belligerence and the suggestion that both parties are equally to blame for violence along the Line of Contact when that is not the case,” Schiff’s letter states. 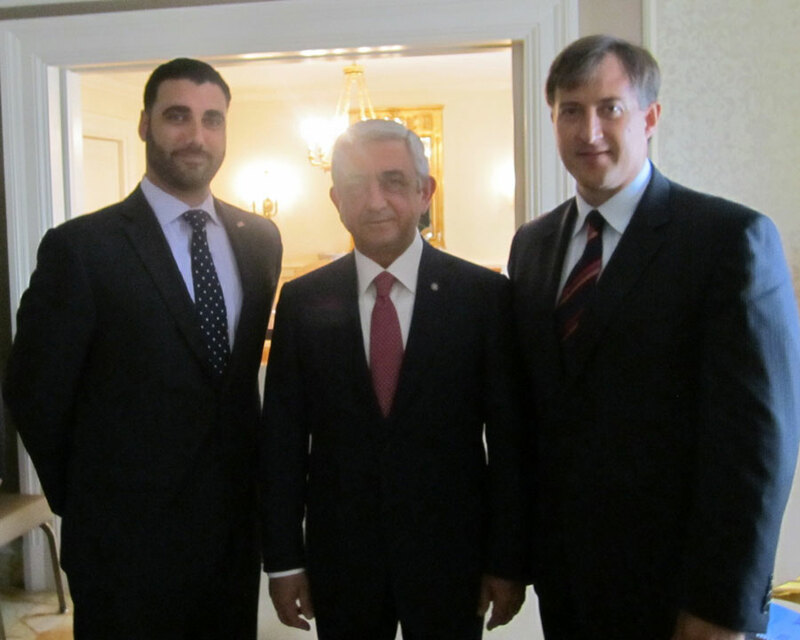 Last week, Florida Armenians Managing Editor Taniel Koushakjian sat down with Armenian President Serzh Sargsyan during his trip to Washington, D.C. Sargsyan travelled to the U.S. to attend the United Nations General Assembly (UNGA) in New York City where he delivered an impassioned speech about the need for international condemnation of Azerbaijan military attacks against Armenia and Nagorno Karabakh that has recently claimed several lives, including three Armenian female civilians, in the last few weeks. From New York, President Sargsyan, accompanied by Foreign Minister Eduard Nalbandian, Presidential Chief of Staff Vigen Sargsyan, and Armenian Ambassador to the U.S. Tigran Sargsyan, travelled to Washington, D.C. for a series of meetings with Armenian American community leaders. Koushakjian shared with Sargsyan activities of the Armenian community in Florida marking the 100th anniversary of the Armenian Genocide. Koushakjian explained that Florida is one of 43 states that has acknowledged the 1915 Armenian Genocide by Ottoman Turkey, which was last proclaimed by former Governor Jeb Bush in 2006. Although Florida recognizes the Armenian Genocide, it does not have an official curriculum mandated by the state to teach the Armenian Genocide. Sargsyan inquired if the presidential candidate was aware of his strong record on the Armenian Genocide, which Koushakjian assured him was the case. In that regard, Koushakjian talked about efforts by Florida Armenians and the Armenian Assembly of America to advance Armenian Genocide education in the Sunshine State despite lack of a state mandate. For instance, in April of this year Koushakjian presented an Armenian Genocide exhibit entitled “Iconic Images of the Armenian Genocide” at the Holocaust Museum of Southwest Florida (HMSWFL). In the lead up to the presentation, the Turkish Consulate in Miami wrote a threatening letter to the HMSWL objecting to the presentation and demanding it be canceled. 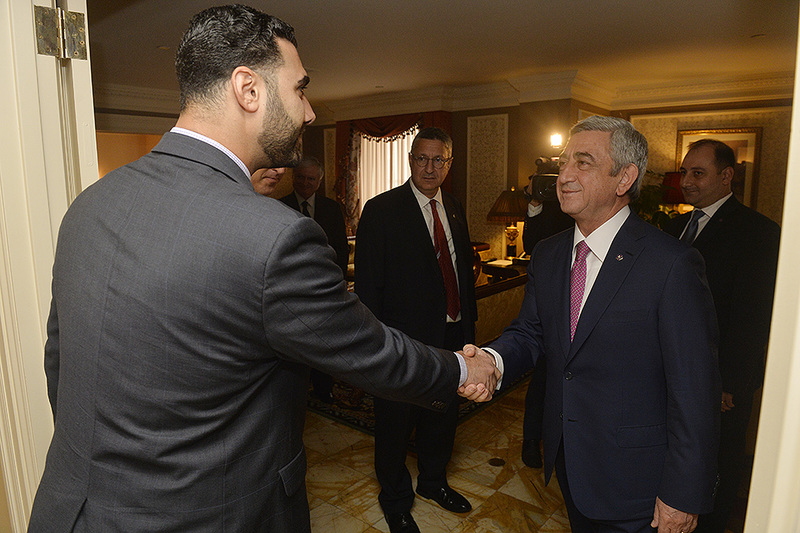 Koushakjian explained to Sargsyan that Armenian Genocide denial exists around almost every street corner in America and that grassroots efforts promoting genocide education are vital to ensuring a future free of mass atrocities. In addition, Koushakjian thanked Armenia’s Foreign Minister Eduard Nalbandian for his efforts to confront and assist with the Syrian refugee crisis. To date, Armenia has absorbed close to 20,000 refugees, the majority of which are the most vulnerable communities: Armenians, Assyrians, Yezidis, and other religious minorities. In addition to Armenian government efforts, Nalbandian has raised the cause of the Syrian peoples’ plight to the international community on several occasions this year alone. Koushakjian informed Nalbandian that Florida Armenians would do everything they can to inform the American public that Armenia is the last Christian safe haven in the Middle East. 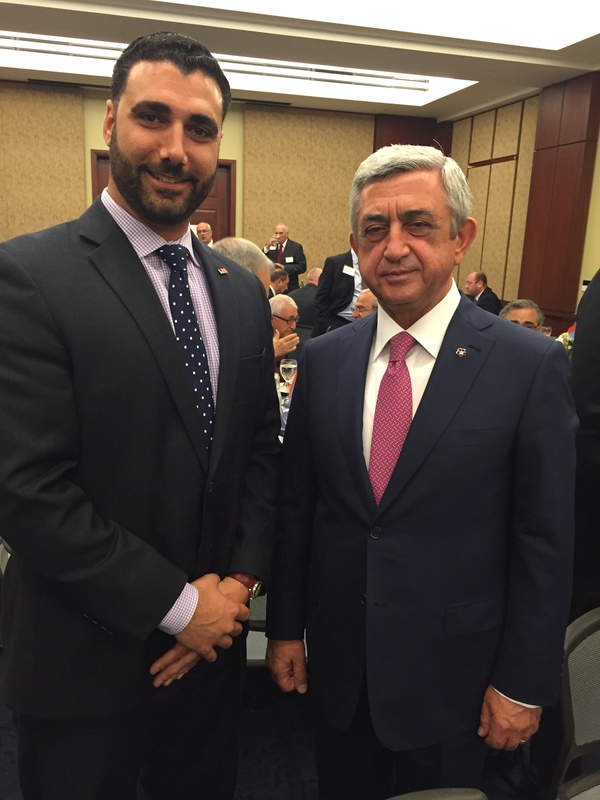 In the afternoon, the Florida Armenians attended a luncheon on Capitol Hill hosted by the International Raoul Wallenberg Foundation (IRWF) and the Congressional Caucus on Armenian Issues in honor of President Sargsyan. House Foreign Affairs Committee Chairman Ed Royce (R-CA) gave remarks and introduced President Sargsyan. “For years, the International Raoul Wallenberg Foundation has been a leading voice promoting awareness of the Holocaust and other genocides throughout history, and the Foundation has called upon all of us to have the courage to stand against such despicable brutality in the future,” stated Chairman Royce. “As the leader of a people who survived the first genocide of the twentieth century, President Sargsyan is well aware of the need for that courage. We must continue to speak the truth about the Armenian Genocide and learn its bitter lessons in order to help others who are targeted,” Royce said. The luncheon featured remarks by special guest Robert M. Morgenthau, grandson of U.S. Ambassador to the Ottoman Empire Henry Morgenthau, who received an award from IRWF Chairman Eduardo Eurnekian and co-founder Baruch Tanembaum for his efforts advancing Armenian Genocide recognition. On Thursday, October 1, President Sargsyan concluded his visit to Washington with a presentation at the Carnegie Endowment for International Peace.